Cleopatra’s Daughter tells the story of the daughter of Cleopatra VII and Marc Antony, Cleopatra Selene. After her parents’ suicide, Selene and her twin brother Alexander Helios and little brother Ptolemy become prisoners/guests of Octavian, who is later known as Emperor Augustus. Ptolemy dies on the voyage to Rome, leaving Selene and Alexander to live with the man responsible for their parents’ death. Michelle Moran is quickly becoming one of my favorite authors. 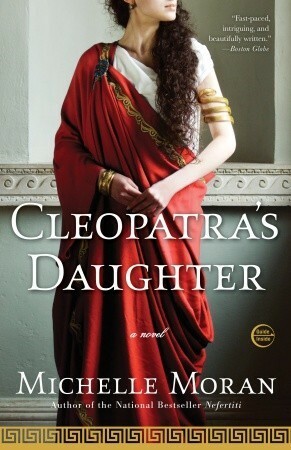 After devouring Nefertiti and The Heretic Queen, I was anxious to get my hands on Cleopatra’s Daughter. I was not disappointed. I have always been fascinated with Roman/Greek/Egyptian history, and Moran’s novels are so wonderfully written as to be informative and engaging. While she does exercise creative license here and there (changing a few names so as to avoid confusion, inserting a character that did not exist historically), I felt that the information in the novel was pretty accurate. From what I remember of my Latin and history classes in high school, I think she stuck pretty close to history while still writing the novel as a work of fiction. My one disappointment, which isn’t even a major one, is that I wish the novel had gone into Selene’s actual reign. But since the book is already pushing 500 pages, and there is already a decent amount written about her, I understand why Moran didn’t go any further. I thought that where she ended it was perfect, although I can understand that some people might think there isn’t a lot of buildup leading up to it. Moran notes that if Selene and Alexander seem precocious for their age, “that is because they were the extremely well-educated children of a queen considered to be one of the most learned women of her time.” The children speak many languages, like their mother did, and spent a lot of time studying, so they do come across as a bit older than they really are. Much like with Nefertiti and The Heretic Queen, the language in Cleopatra’s Daughter is incredibly vivid and engaging. The characters seem incredibly real, and Moran clearly went to great lengths to depict their personalities as accurately as possible based on historical evidence. The relationship between Selene and Alexander is that same bond that twins I know have. They only had each other, and you can practically feel their closeness. While part of me wishes that there were a bit more dedicated to their relationship with their parents (there is hardly any interaction between the twins and Marc Antony, and Cleopatra commits suicide at the end of the second chapter), the simple fact is that this is Selene’s story, and starting things in medias res is what makes the novel so engaging. This novel, as well as the other two I’ve mentioned, are must reads for fans of Greek, Egyptian, and Roman history. Tagged cleopatra's daughter, egyptian history, greek history, michelle moran, nefertiti, roman history, the heretic queen. « What Does Beyonce’s NYABJ Award Mean for Journalists?